“Paysage—troupeau de vaches” [Landscape— Herd of cows], 1849, printed by Auguste Delâtre (1822–1907) and published by Marchant (c.1830–80), Alliance des Arts, Rue de Rivoli, 140, Paris. Based on Guiffrey’s description, I propose that this print is from the third state (of four states?). Guiffrey does not mention the inscribed publisher’s address featured in the British Museum’s copy signifying that the BM's copy is the fourth state—unless the address is erased which would make this a fifth state. Condition: richly inked and crisp impression with margins. There is are a few very faint spots otherwise in excellent condition (i.e. there are no signs of abrasion, tears or stains beyond the very faint spots which may be an integral part of the paper rather than a flaw). 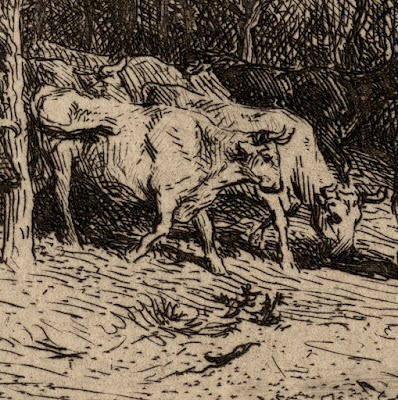 I am selling this exquisite etching exemplifying the spirit of the Barbizon School of artist for AU$118 (currently US$84.78/EUR76.27/GBP57.98 at the time of posting this print) including postage and handling to anywhere in the world. If you are interested in purchasing this original Jacque etching referencing the old masters, please contact me (oz_jim@printsandprinciples.com) and I will send you a PayPal invoice to make the payment easy. 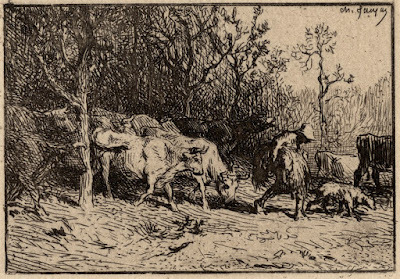 In 1848, a year before Jacque executed this etching, Jean-François Millet (1814–75) began to make his first etchings. I mention this seeming unrelated date as it was a watershed moment for both Jacque and Millet: for Millet, 1848 (Michel Melot suggests 1947) marked the beginning his explorations of etching through his appreciation (Melot suggests “imitation”) of Jacque’s prints; for Jacque the date marked a change from his former approach of rendering images with fine lines to the confident emphatic lines of his mature work. 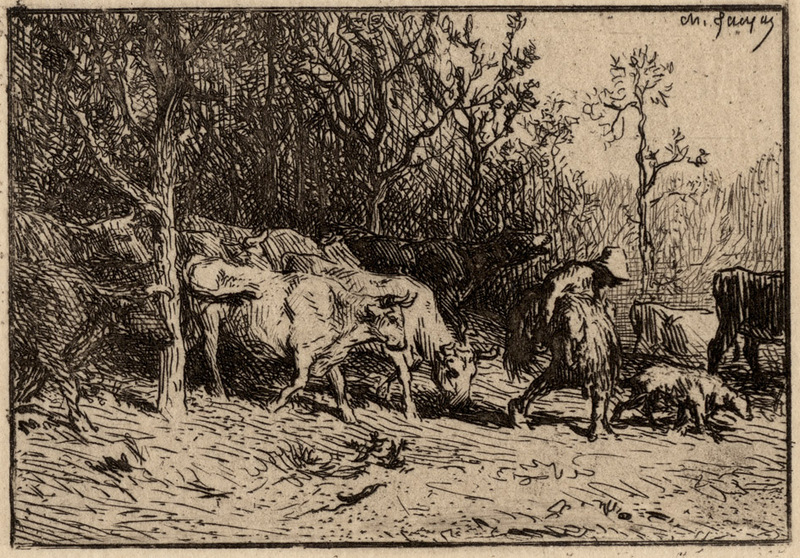 In short, 1848 signified a time when both artists were under the influence of each other in creating the powerful images—like this print—that exemplify the Barbizon movement. 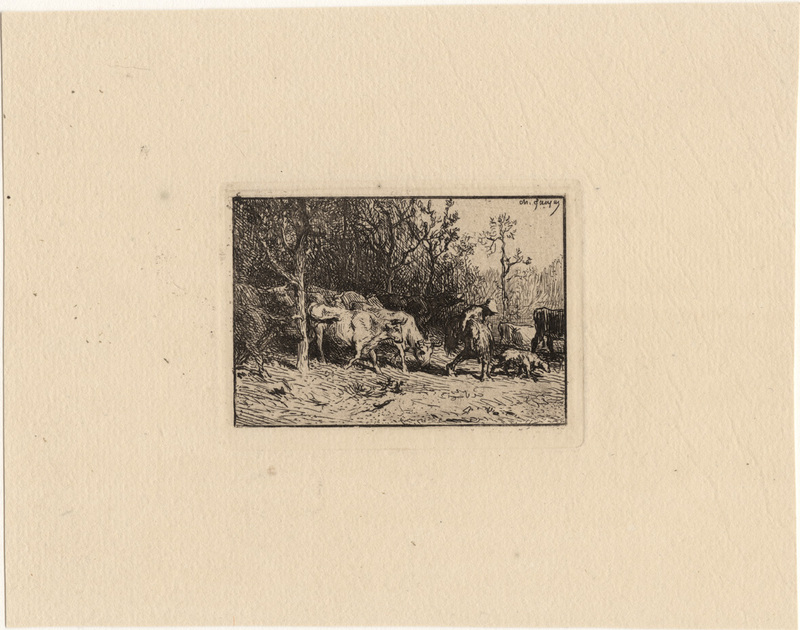 Regarding this print, I can see the strong influence of Millet’s vision of the noble rural worker that underpinned Jacque’s prints after 1848. 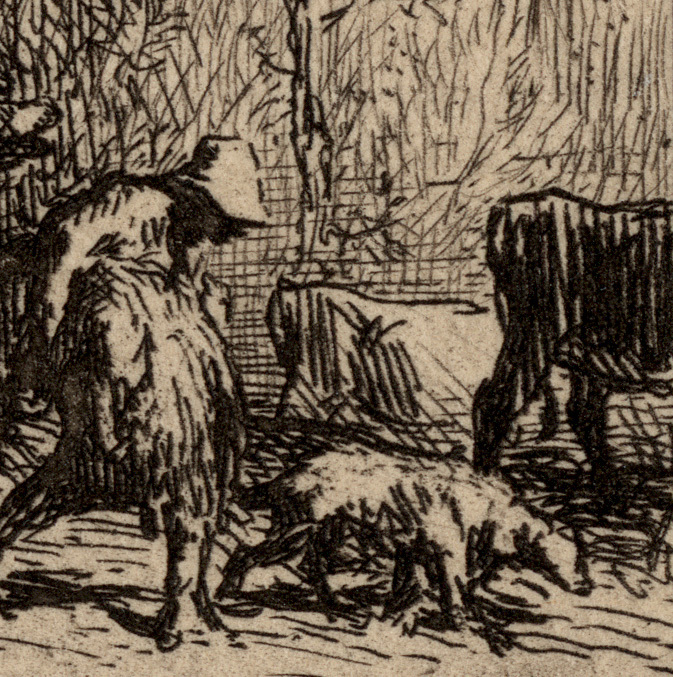 This shared vision is certainly evident in Jacque’s choice of subject for the etching—a weary farmer carrying a sheaf of wheat under his arm while leading a herd of cows from a forest into a clearing—but the shared vision is also evident in even small details like the treatment of the portrayed farmer. 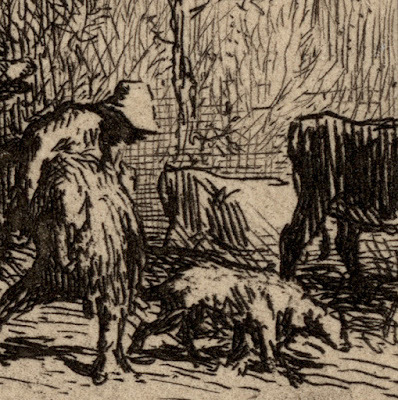 For example, compare the similarities between this figure and the farmer in Millet’s etching, “Le Paysan rentrant du Fumier” (1855) that I have posted previously.